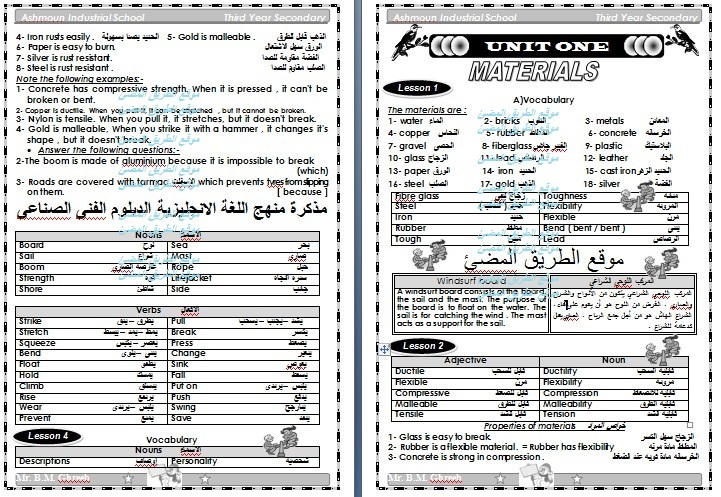 مذكرة لغة انجليزية لدبلوم ثانوى صناعى 3 سنوات . تصفح مذكرة انجليزى لدبلوم التجارى. 1- Concrete has compressive strength. When it is pressed , it can't be broken or bent. 2- Copper is ductile. When you pull it, it can be stretched , but it cannot be broken. 3- Nylon is tensile. When you pull it, it stretches, but it doesn't break. 4- Gold is malleable, When you strike it with a hammer , it changes it's shape , but it doesn't break. الطرق تغطى بالأسفلت الذي يمنع الإطارات من التزحلق عليهم . = It is necessary to test the engines every 5,000 km. = The wheels have to be lubricated before every journey.